Physiology & Behavior is aimed at the causal physiological mechanisms of behavior and its modulation by environmental factors. 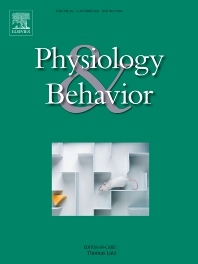 The journal invites original reports in the broad area of behavioral and cognitive neuroscience, where the interaction of physiology and behavior is the prerequisite for all published material. The range of subjects includes behavioral neuroendocrinology, psychoneuroimmunology, learning and memory, ingestion,taste, social behavior, exercise (as it relates to behavior), studies related to the mechanisms of psychopathology and studies using animal models with the purpose of translating the findings to humans. Purely pharmacological studies (either using natural compounds or synthetic chemicals), studies on improving human performance beyond physiological adaptations, or studies on improving livestock production are not in the focus of the Journal. We also welcome contemporary reviews and theoretical articles, and the Editors invite such proposals from interested authors. Editors invite such proposals from interested authors. Thematic issues and more comprehensive studies are also considered for publication, subject to the same review standards and process. Articles will be published in English.